I just found out that my boss's mother has died in Korea. I've heard that it's customary to give money to the person who has lost a loved one, but I've known my boss for 2 years and it just seems insensitive to me if all I did was give him some money. Why do Koreans do that? Is there something else that I can do that is more personal? A side effect of the custom of giving money (the money itself is called bujo) is that the family of the deceased should only give the official notice of the funeral (called bugo) to those close to the deceased and the family. Because those who received the notice is expected to attend the funeral and give money, it is bad manners to give the notice to mere acquaintances. Some more about what Korean funerals look like. Korean funerals traditionally had a very long and elaborate procedure, but modern Korean funerals are simplified, and often adjusted for religious beliefs, especially among Christians. Korean funerals generally last three days. When a person dies, first the body is set in a straight position and covered in a white sheet. Then it is put behind a partition. In front of the partition, a small table is set up with a photo of the deceased and incenses. Then the person’s death is announced. Official notice of the funeral is sent out, and a sign is hung on the front door of the house. 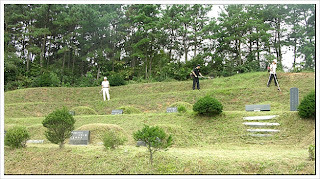 On the second day, sangju arranges for cleaning of the body, which is usually done at a funeral home. Koreans don’t embalm the dead. 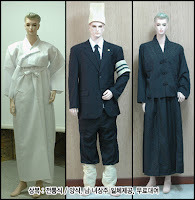 The body is cleaned and dressed – there is a traditional garb for the dead, but suits are commonplace in modern Korea. After the body is dressed, it is put in a casket. The casket is again set behind a partition or a black curtain, and a table with the photo of the deceased, candles, and incense is set up. A black ribbon is put on the photo at this time. Sangju sits next to the table on a coarse mat – the mat is coarse because sangju must atone for the sin of allowing his parent to die. Then is the time for visitors. Visitors wear black suits as American mourners would. Mourners first light a stick of incense at the table, bow at the table, then sangju and the guest bow at each other. Traditionally sangju, as a sinner, is supposed to remain quiet for the entire proceeding, but now they are allowed to say brief thanking words to the guests. As they are leaving, visitors leave the envelop with money in a designated box. On the morning of the third day, the casket leaves the house. Before it leaves, a short ceremony is held in the honor of the dead – if you were trying to find one ceremony called “funeral” in a Korean death ritual, this would be it. The personal history of the deceased is told, and people eulogize and offer incense. Traditionally, sangju and his relatives carried the casket all the way to the burying ground, but now Koreans use a hearse. The casket is taken to a pre-arranged burial ground, which is near other family members' burial sites. (See picture.) Typically, an extended family owns a small mountain and sets up burial sites for the entire family, past, present and future. The Korean himself already knows where he will be buried when he dies. Believe it or not, the thought is somewhat comforting. After the casket is lowered, sangju throws dirt on the casket three times. Then the grave is fully filled, and a little mound is built on top of the grave. The mound is then covered in grass. On the right bottom side of the mound, a small stone with the name of the dead is buried so that the grave can be identified even though the mound is eroded away. The tombstone is set up in front of the grave, and brief ceremony is held once again. But technically, the official funeral is not over after 3 days. Sangju keeps wearing the black ribbon for 100 days; traditionally everyone who had to wear to hemp garb had to keep them on for 100 days, but that does not happen anymore. After 100 days, a memorial ceremony for the dead is held, and the funeral is finally over. Well, while I agree with pretty much everything you've said, there are still a few families out there who do go all the way, especially out in the country. While I was studying for the MCAT a few summers ago, my maternal grandmother passed away. My maternal grandfather was (he had passed before then) the eldest of his branch of the Gimhae Kims, which was the Samhyun pah. Much of the rest of that side of the family family (half-brothers, half-sisters, and so on) were from rural/semi-rural Gyeongsang-do (Uiryeong was my maternal grandfather's gohyang). Anyways, we actually had a small ceremony at a funeral place near the hospital where my grandmother spent her last days (actually I can't recall if it was in the basement of the hospital or not, but I don't think it was), and in the following days, we actually took the coffin, with all of its decorations and money pinned to it, to the hill where we buried our grandmother next to our grandfather. I'm leaving a crapload of details out (most of which were pretty much the same as what you described), but the point is, not everyone uses a hearse, we wore the full hemp costume, and the whole nine yards. I can't say the same for other families, but I don't think it's a general rule that everyone uses a hearse or doesn't wear the full hemp. You guys also fail to mention that typically these days bodies aren't buried, they are cremated, then either buried or scattered somewhere where the dying person wishes. I rarely see people buried with their bodies still in tact. If you go to Korea now, they are usually buried in urns in a little locker with the person's name on it. What happens in families with daughters but no sons? who is the sangjo? Is it the eldest daughter or another male relative like a brother? What is the name of the locker type place where they keep the urn, flowers, and a picture? I tried googling "korean shrine locker" and "korean locker for deceased" and couldn't find anything. Laura, I believe the sangju is selected based upon: 1) oldest son 2) Son-in-law (if the daughter is married the responsibility goes to her husband) 3) if any/ all daughters remain unmarried, any/all the girls take responsibility equally. It's confusing because I also wondered what would happen in the case of having daughters and a younger/ youngest son (youngest son is then sangju?) or if the older daughter / younger son situation with the daughter being married--if the responsibilities would still go to the son-in-law....and lastly, why don't the responsibilities go to the eldest daughter vs ALL (2 or more)...so it's pretty mystifying. The locker type place where urns are kept is called a Charnel house. I don't know the Korean word/translation. My friend was a Christian and his body was cremated before he was brought back to Korea. How is the ceremony for a dead person from a modern Christian family? What is their grieving process? I tried to research about it as me and my friend never discussed about death when he was still living. I hope that someone can help me. Yes. We live in America and this is totally acceptable and kind. I also think that giving money to your boss is not an acceptable outcome. However, we have to follow the traditions and cultures in case we want to fit in them. I recommend you to follow the instructions of the Korean and send money according to the custom.